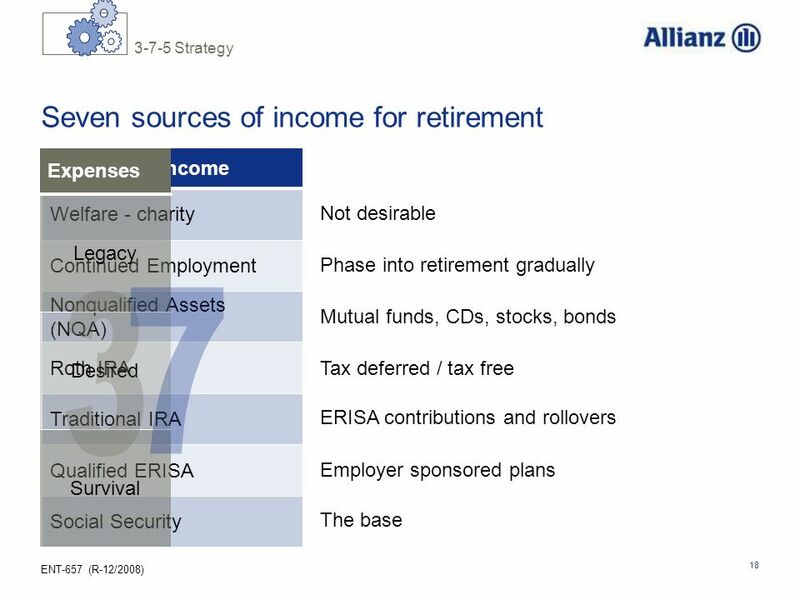 The retirement income strategy So what is a retirement income strategy? 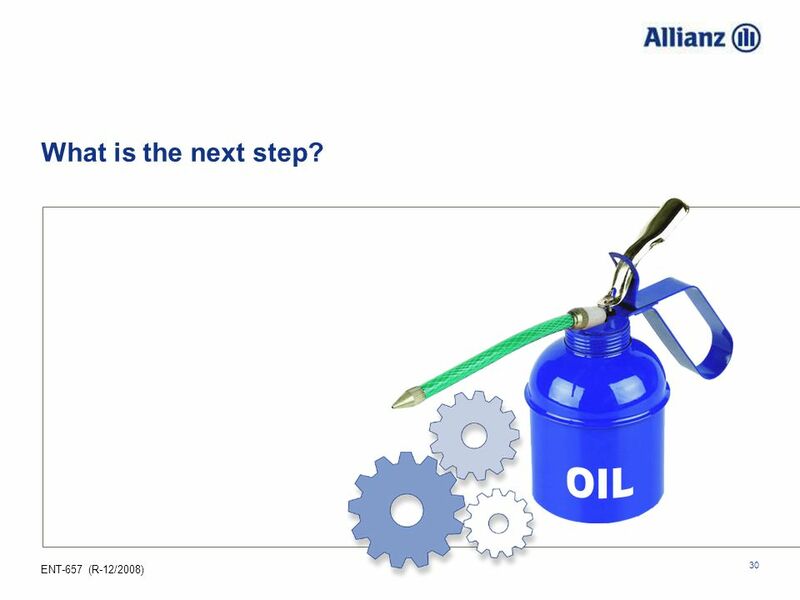 Let’s use the simple analogy of oil in your car. If you start your car, and there is no oil in the engine, it will run for awhile. But fairly soon its going to stop. The lack of oil can create expensive problems. 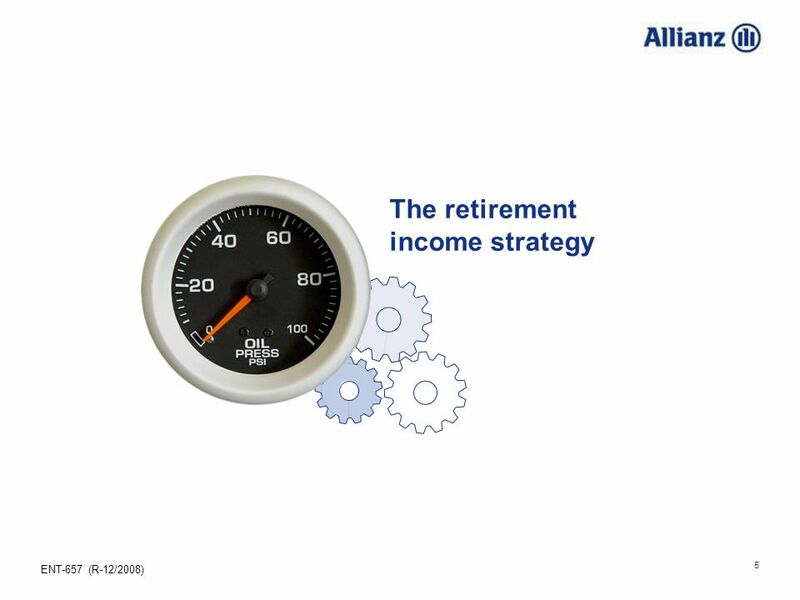 Just as oil in your car can help it run a long time, a retirement income strategy is designed to make sure your income doesn’t stop. 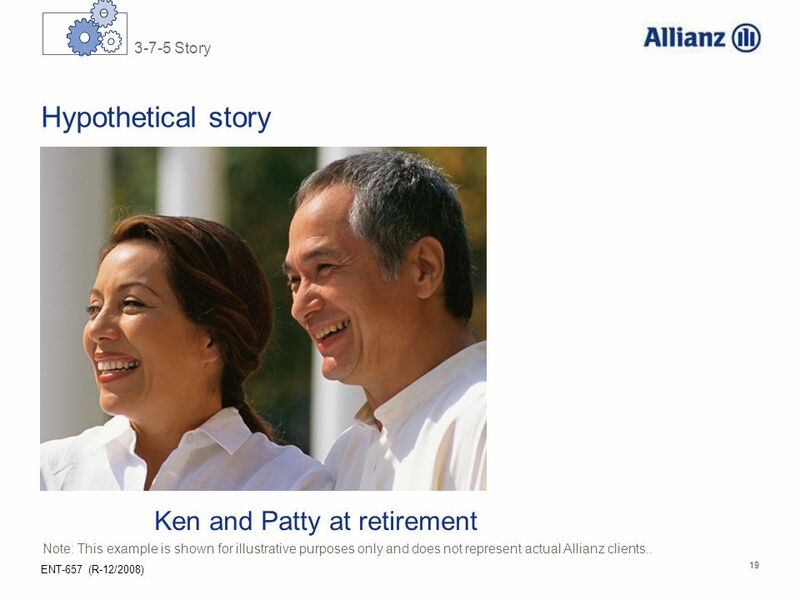 Retirement only happens once – its important to plan well. 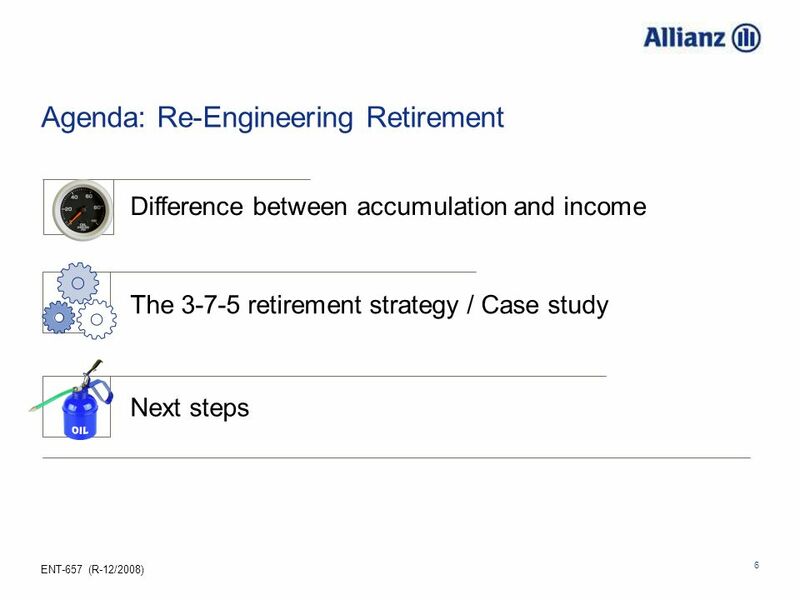 Agenda: Re-Engineering Retirement Difference between accumulation and income The retirement strategy / Case study Next steps OIL Here is what we’ll be considering as we think about ways to Re-Engineering Retirement: Important difference between accumulation and retirement income? We’ll set the stage by taking a closer look at the challenges of transitioning from “accumulation” to “income”. 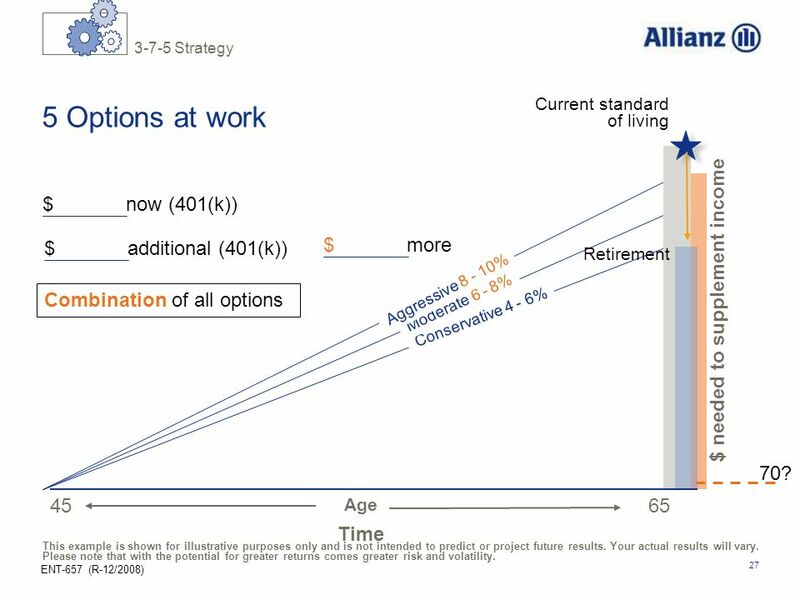 The retirement strategy? 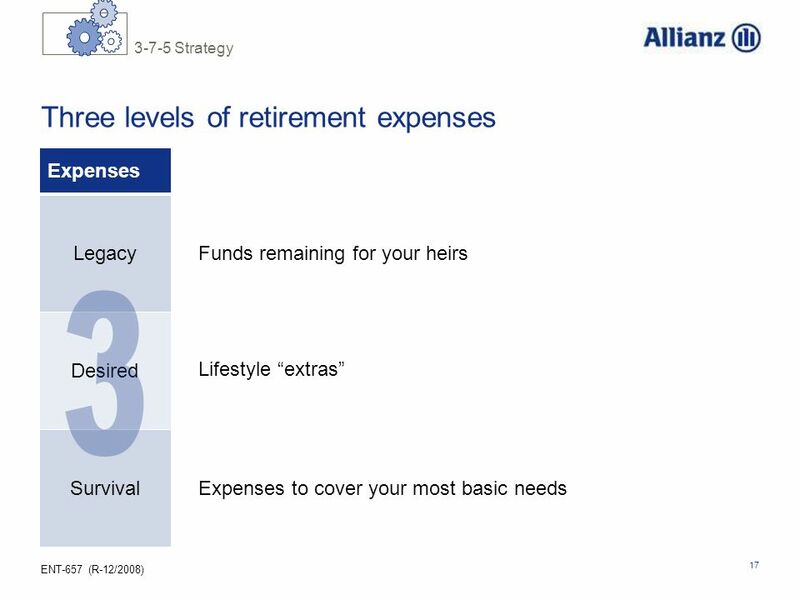 We’ll learn about three levels of retirement expenses, seven sources of retirement income, work through a hypothetical case study, then look at five options for improvement if what you’ve accumulated doesn’t match up with what you believe you’ll need and want during retirement. 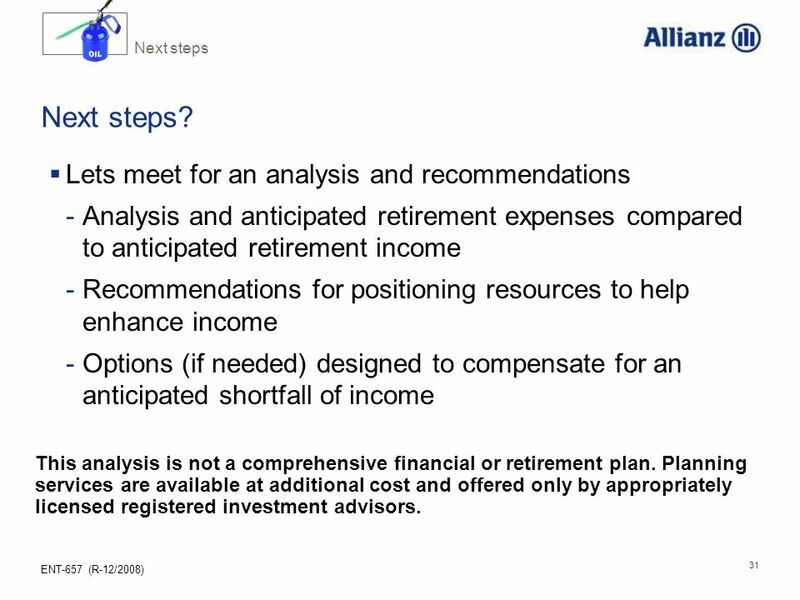 And finally, I’ll explain What are the next steps so you’ll be ready to put the Re-Engineering Retirement process to work for your benefit. 8 How much money will we need? Will we have enough to get by? 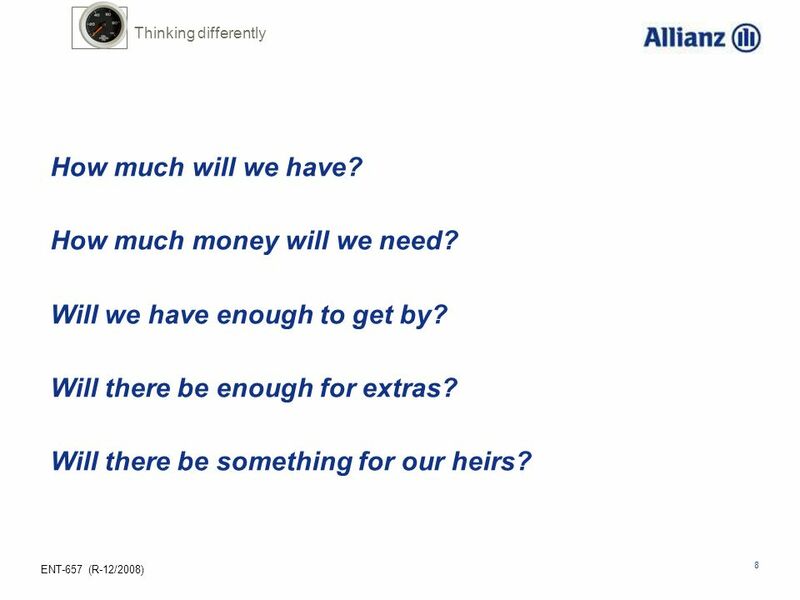 Thinking differently How much will we have? How much money will we need? Will we have enough to get by? Will there be enough for extras? Will there be something for our heirs? How much will we have? [click] How much will we need? [click] Will we have enough to get by? [click] Will there be enough for some extras? [click] Will there be something left for our heirs? 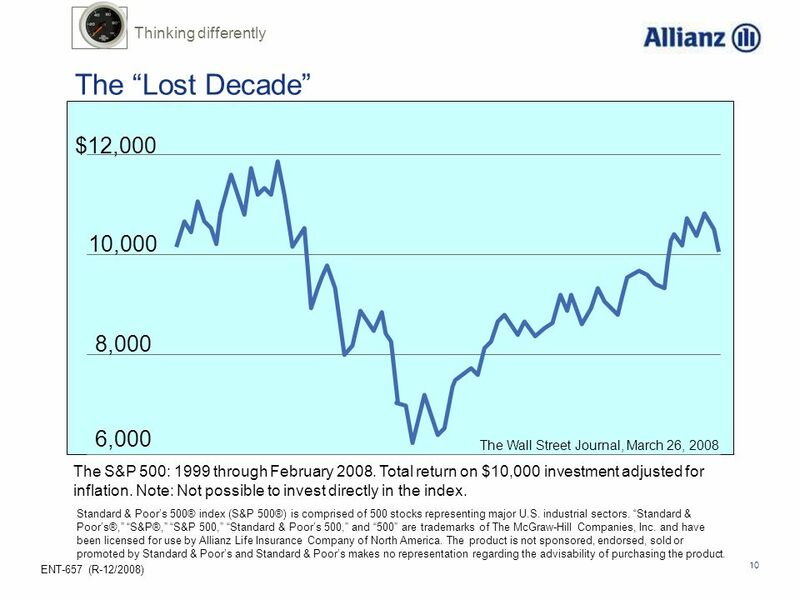 The “Lost Decade” $12,000 10,000 8,000 Total return on a $10,000 investment in the S&P 500 from 1999 through Feb (adjusted for inflation) resulted in the longest funk since 1970 or what has become commonly known as “The Lost Decade”. 6,000 The Wall Street Journal, March 26, 2008 The S&P 500: 1999 through February Total return on $10,000 investment adjusted for inflation. Note: Not possible to invest directly in the index. Standard & Poor’s 500® index (S&P 500®) is comprised of 500 stocks representing major U.S. industrial sectors. “Standard & Poor’s®,” “S&P®,” “S&P 500,” “Standard & Poor’s 500,” and “500” are trademarks of The McGraw-Hill Companies, Inc. and have been licensed for use by Allianz Life Insurance Company of North America. The product is not sponsored, endorsed, sold or promoted by Standard & Poor’s and Standard & Poor’s makes no representation regarding the advisability of purchasing the product. 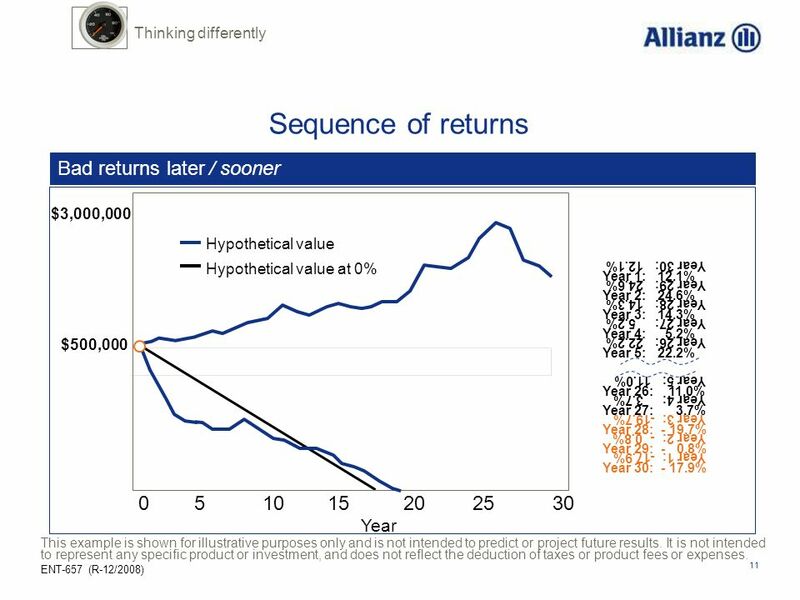 Thinking differently Sequence of returns Bad returns later / sooner $3,000,000 Hypothetical value Hypothetical value at 0% Year 30: % Year 29: % Year 28: % Year 27: % Year 26: % Year 5: % Year 4: % Year 3: % Year 2: % Year 1: % Year 1: % Year 2: % Year 3: % Year 4: % Year 5: % Year 26: % Year 27: % Year 28: % Year 29: % Year 30: % $500,000 Here we have an example of 30 years of investment returns. Sometimes the returns are good and sometimes the returns are not so good. This is what we would expect in the investment world. 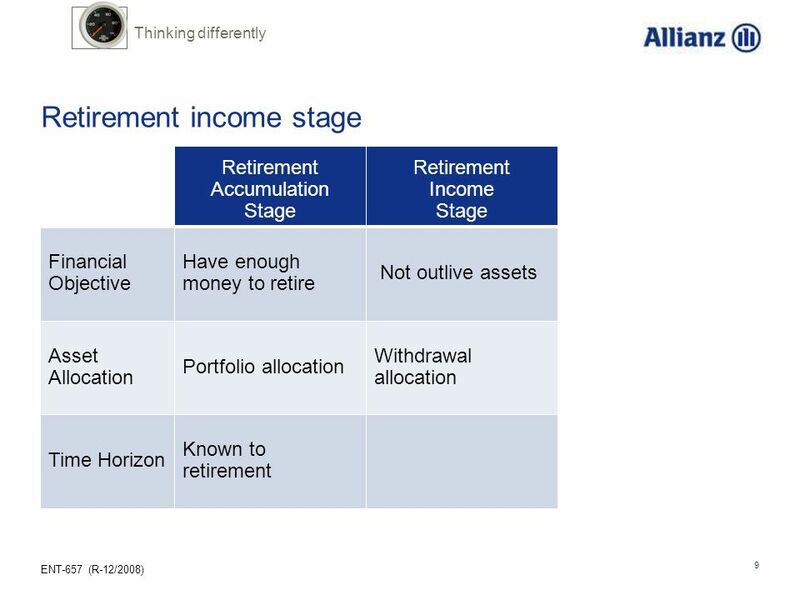 When we move into retirement and we need the account for income, it becomes very important WHEN the returns are good and WHEN they are not so good. In this example we have a $500,000 account that is giving us $25,000 per year (increasing at 3% per year to help offset inflation) We also see that during this hypothetical 30 year period the returns in the beginning are fairly good and we have some difficult years at the end. [click] If this is the scenerio as I’m withdrawing imcome there will be much more money in my account in the end. [click] If we have the difficult years at the beginning of the period you can see a very different outcome. The money is gone around year 19. So the question here is do you have a strategy to address the “sequence of returns” problem? Some think the answer is to become ultra conservative with their money. While that might feel good initially, low rates may do little to help your savings fight off the affects of inflation. Year This example is shown for illustrative purposes only and is not intended to predict or project future results. It is not intended to represent any specific product or investment, and does not reflect the deduction of taxes or product fees or expenses. 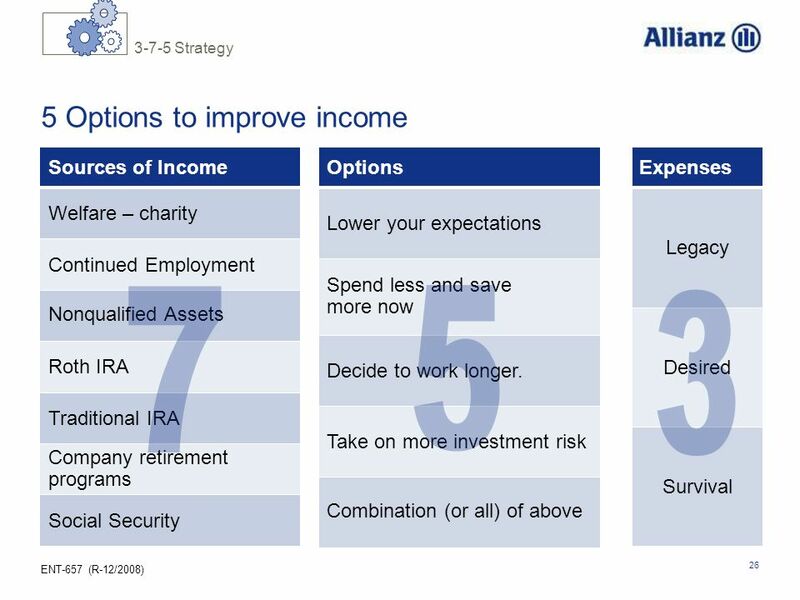 13 How can we make the most of my retirement income sources? 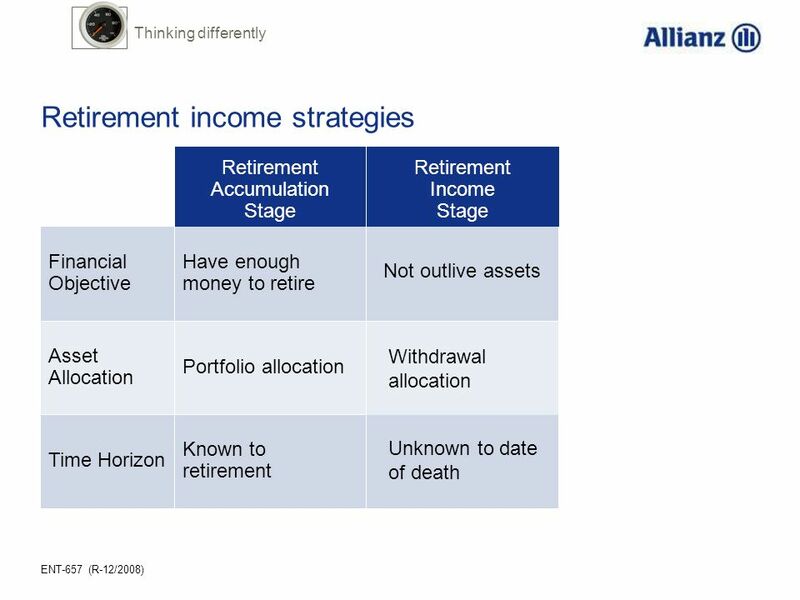 Thinking differently How can we make the most of my retirement income sources? What should we reposition in consideration of tax and transfer issues? What should we spend first, next, last? What should we hold? 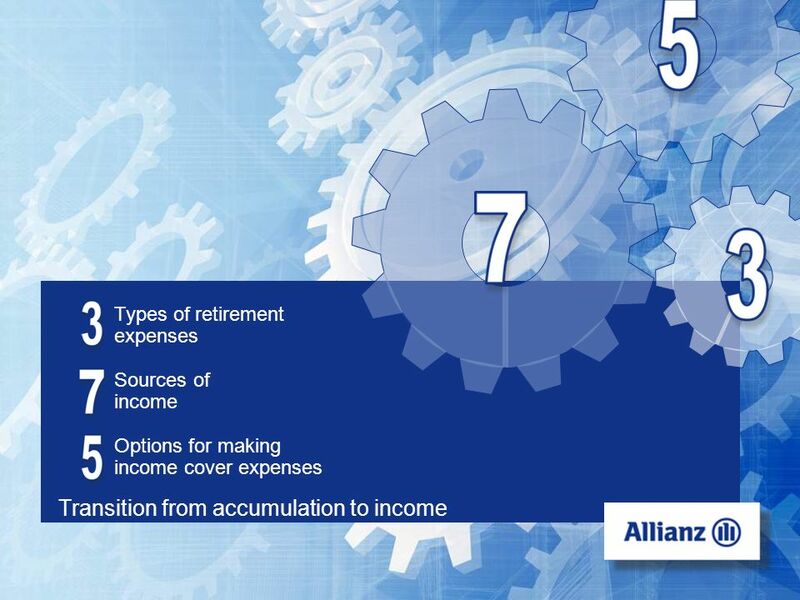 In the income phase we ask questions like: How can we make the most of my resources for retirement income? 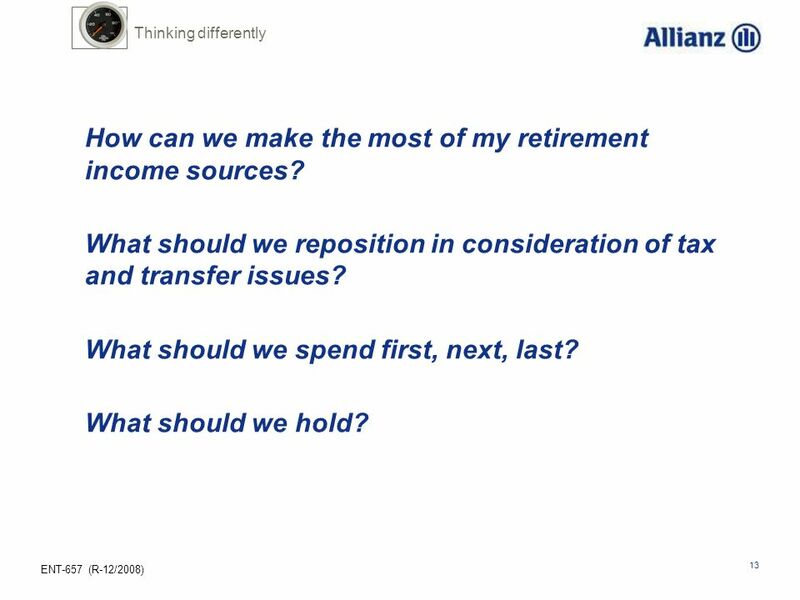 [click] What should we reposition in consideration of tax and transfer issues? [click] What should we spend first, next, last? [click] What should we hold? By the way, one of my favorite financial “tips” is to manage the impact of T.I.P. – T for taxes, I for inflation, and P for procrastination. You’ve already done away with “procrastination” by being here today. We’ll deal with the other two (taxes and inflation) when we start the re-engineering process. 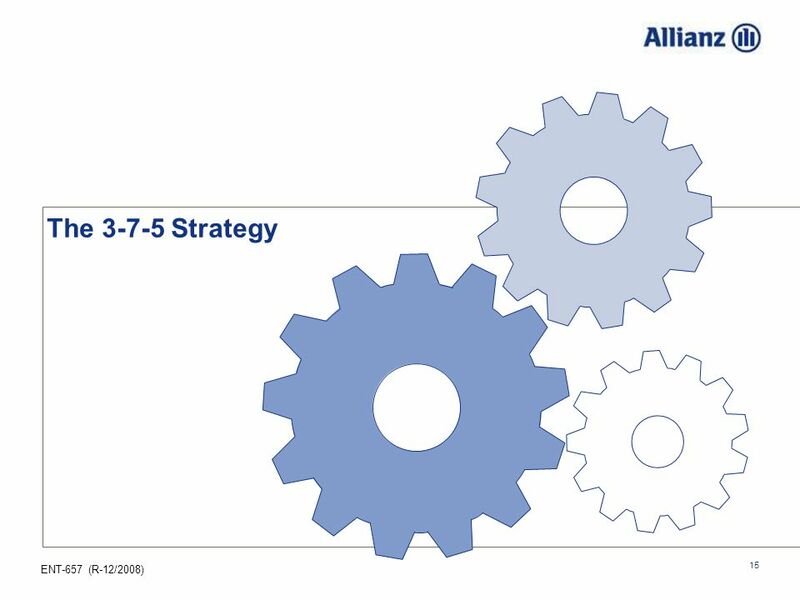 15 The Strategy How does Re-engineering Retirement Strategy actually work? 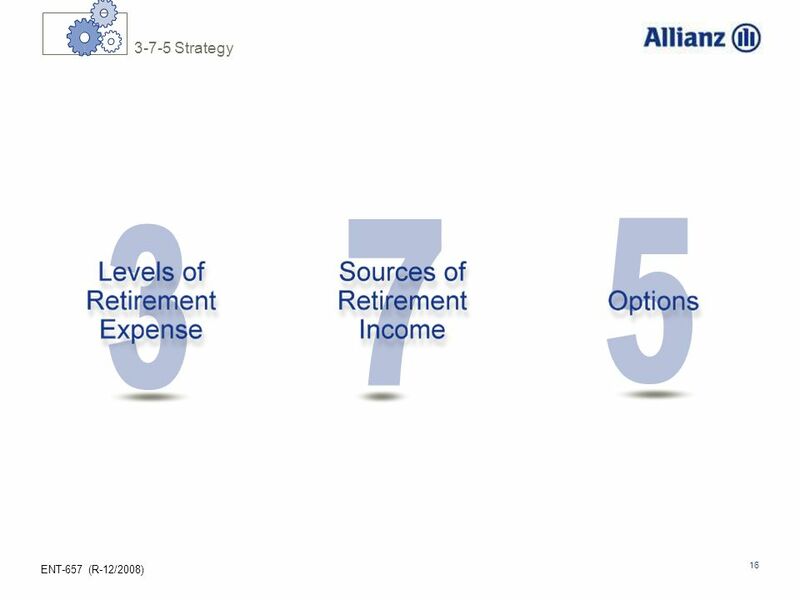 3-7-5 Strategy 3 7 5 Levels of Retirement Expense Sources of Retirement Income Options The Re-Engineering Retirement Strategy considers three levels of retirement expense and then looks at seven sources of retirement income. 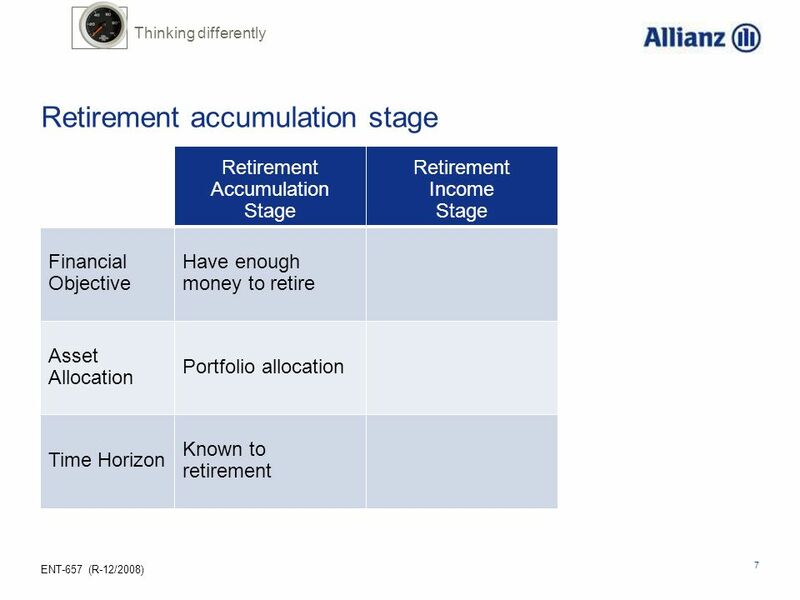 If you are like most people who have done a good job in the accumulation stage, Re-Engineering Retirement is a relatively simple process of moving money around so you can position your resources to help meet your goals for the three levels of retirement expenses. But, just in case your projected retirement income doesn’t match your retirement expenses, we’ll offer five options designed to help improve your financial situation. So, what IF it looks like the assets you’ve accumulated will fall short of what you need and want for retirement income? What if your personal situation is not as “ideal” as the hypothetical case study we just reviewed? 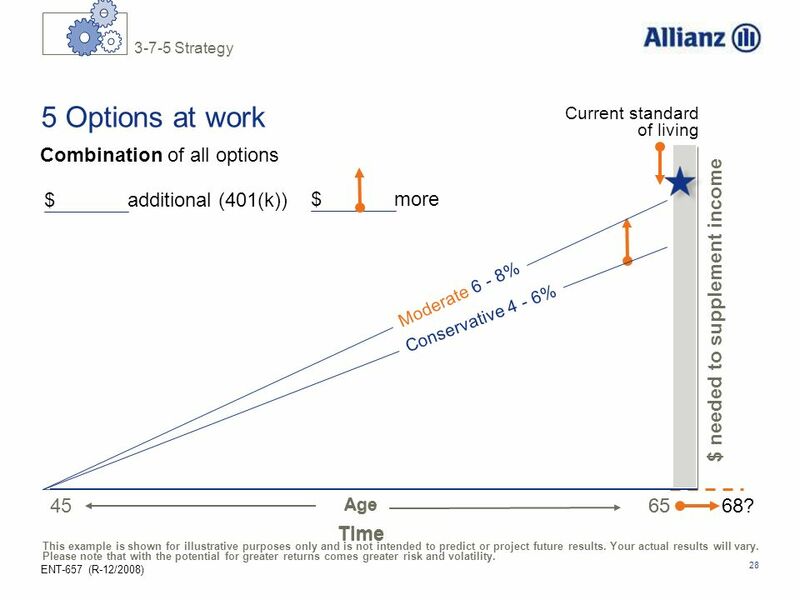 If your retirement income sources won’t provide enough income to meet your survival and desired retirement expenses – even with repositioning – then what? 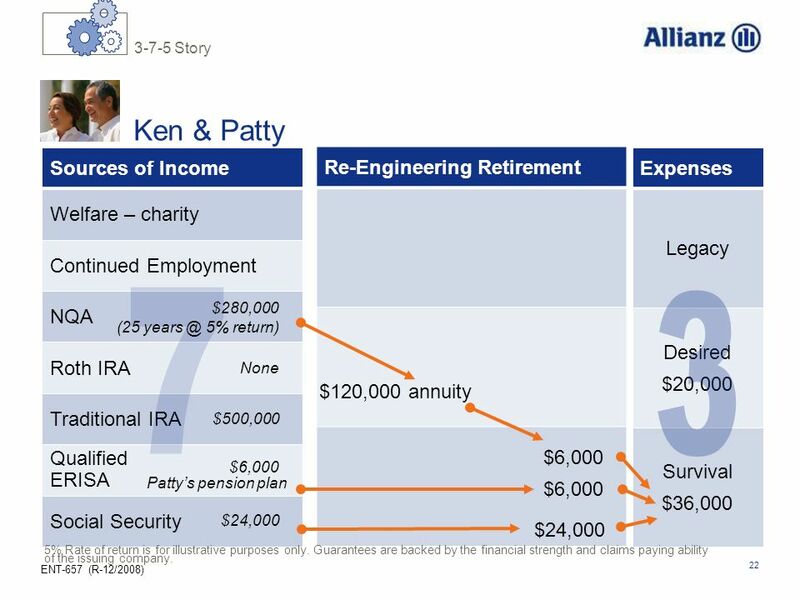 29 Summary Many people approaching retirement are worried about their financial security in retirement Evaluate how well your retirement expenses match up with your retirement income Re-Engineering Retirement can help you successfully transition from accumulation to income OIL Now, let’s close with a three point summary and next steps. 1. 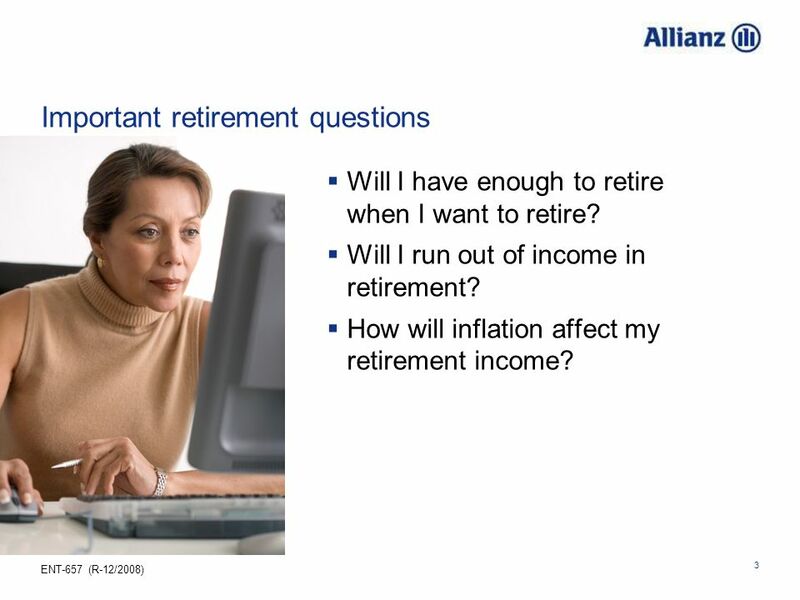 Many people approaching retirement (even some who have accumulated significant assets) are worried about their financial security in retirement. 2. 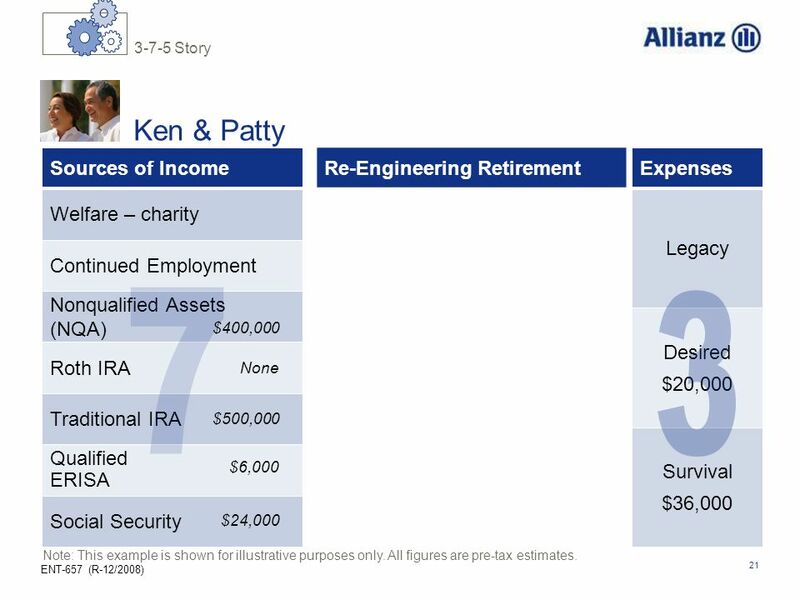 Retirement income strategies help identify how well your retirement expenses match up with your retirement income needs 3. 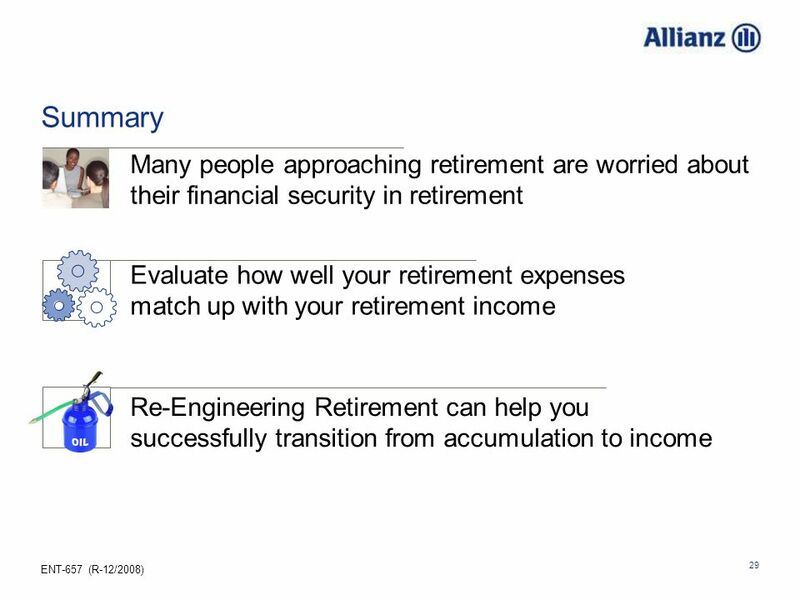 Re-Engineering Retirement can help you successfully transition from accumulation to income, helping to ensure a more financially secure retirement. 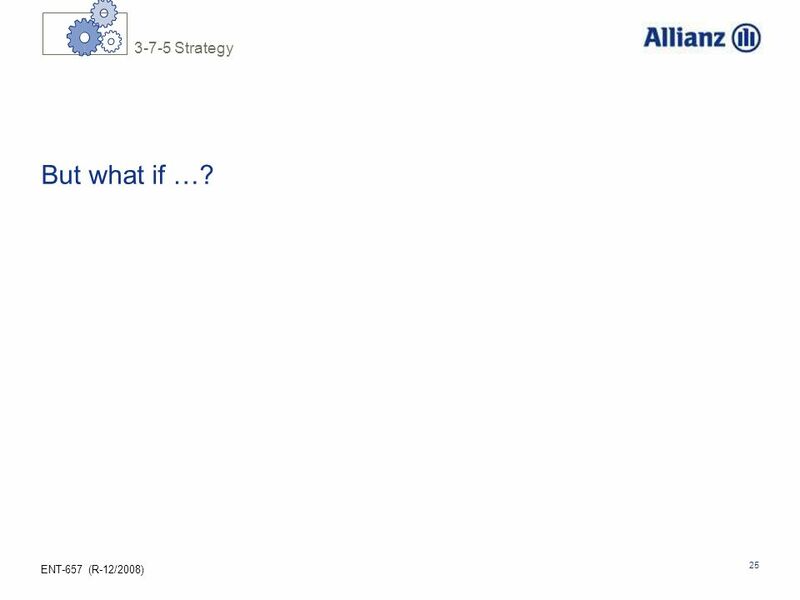 32 © Copyright 2008 Allianz. All rights reserved. 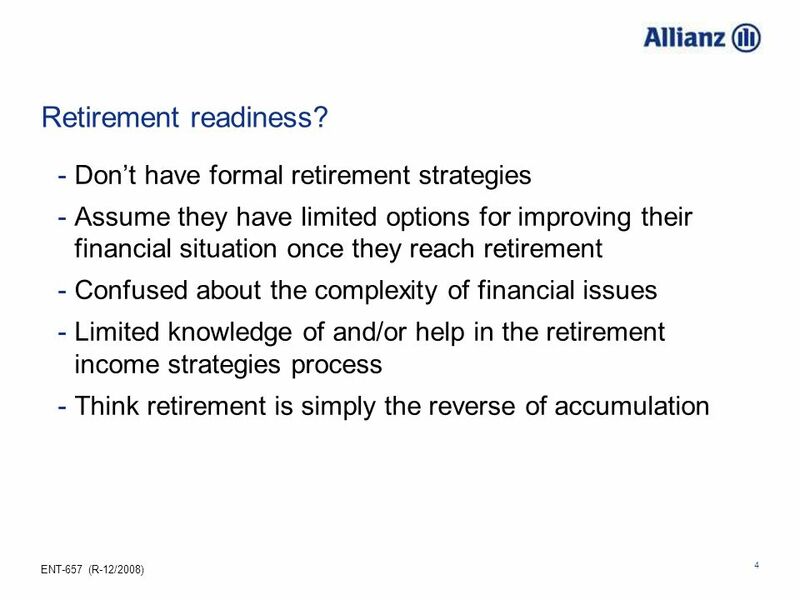 Download ppt "Retirement readiness with the strategy"
USA-1274a (R-8/2007) For Broker/Dealer use only – Not for use with the public. 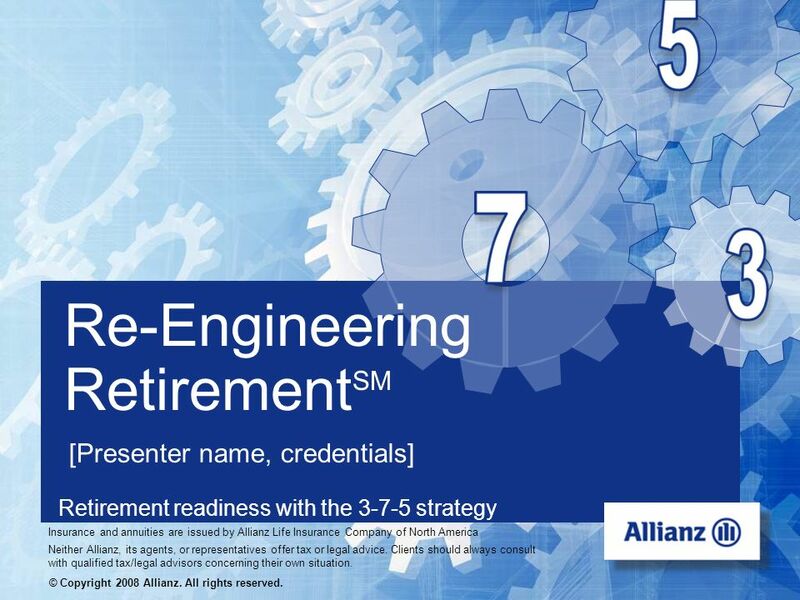 Retirement readiness with the strategy Re-Engineering Retirement SM. 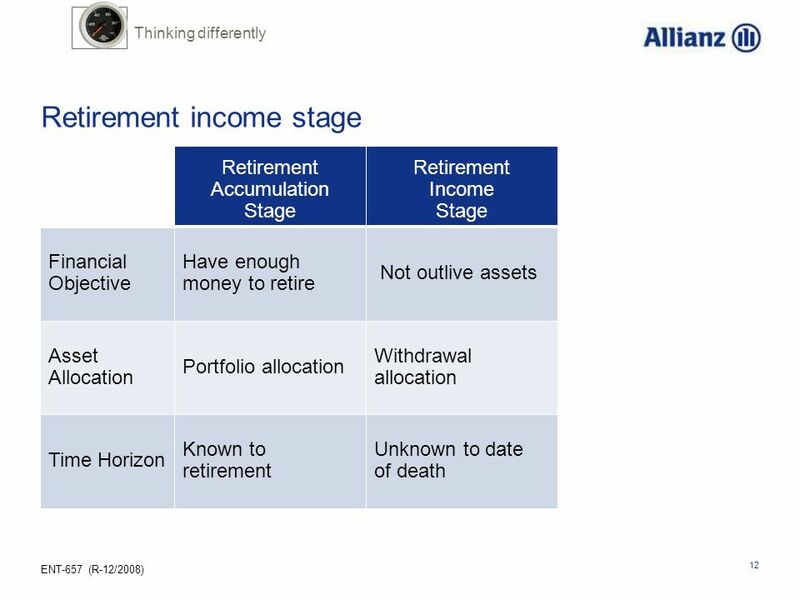 OLA 1004 T 1008 An Estate Planning Technique for Individuals Who Own Deferred Annuities with Sizable Growth. For Agent Use Only. 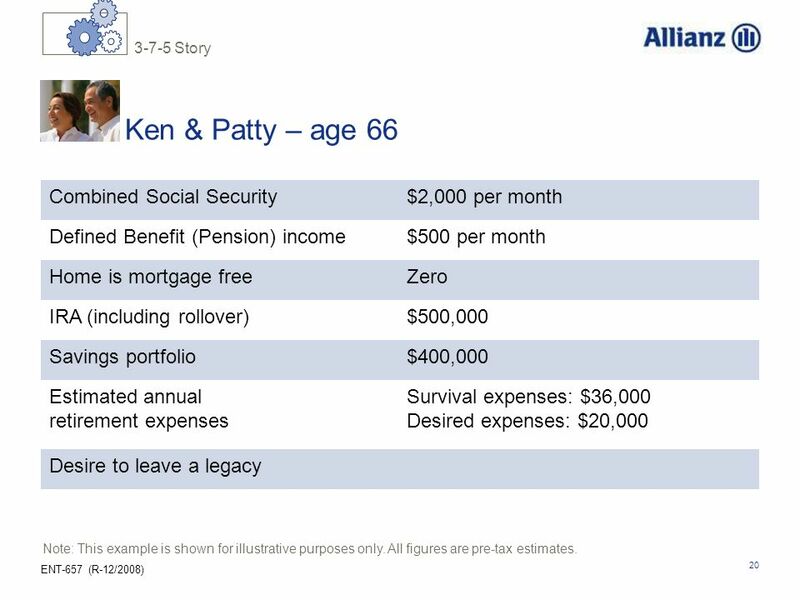 © 2009 American Financial I'd Like a Way to Fund My Retirement That Will: Index my value to the stock market Protect my money Allow. 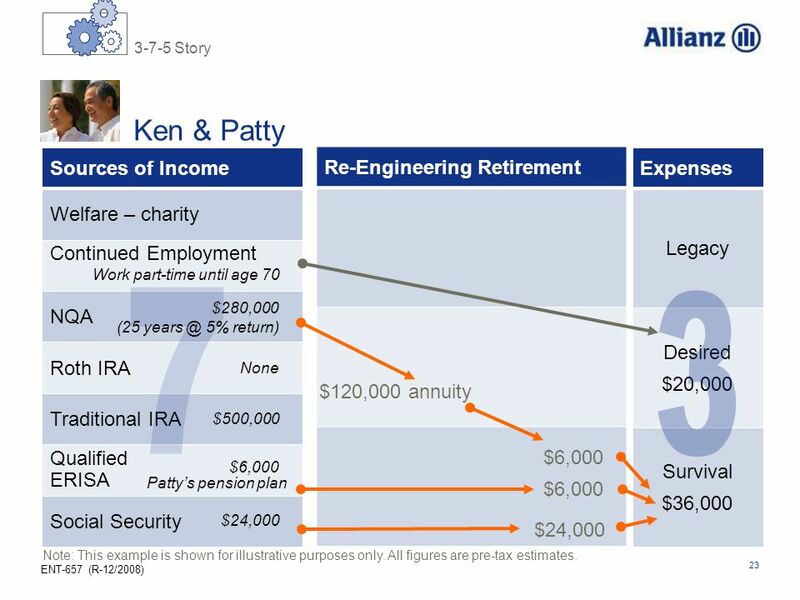 The Annuity Solution. Investment Products are distributed through Registered Representatives of Mutual of Omaha Investor Services, Inc., Mutual of Omaha. 1 Ins301 Chp15 –Part1 Life Insurance and Annuities Terminology Types of life insurance products Tax treatment of life insurance Term insurance Endowment. 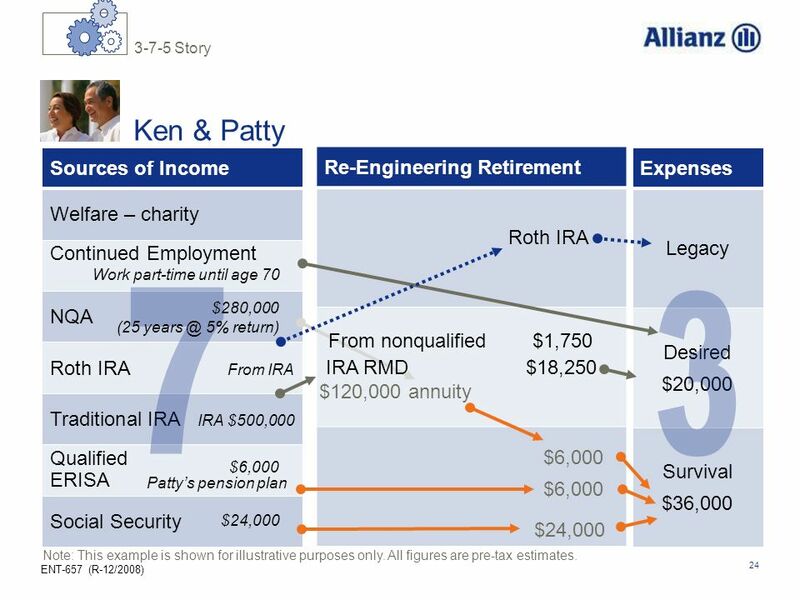 OPPORTUNITY Roth 403(b) accounts More savings opportunities for your retirement SAVING : INVESTING : PLANNING.